Make a Cheesy Bacon Veggie Pancake Bake for breakfast or dinner and you have the perfect protein pancake recipe! Fill this pancake with anything you like and bake it in the oven for an easy BAKED pancake! I love serving this with syrup…or butter…or more cheese. Really, it’s the perfect savory pancake recipe, delicious for every meal. Whenever I don’t know what to make for dinner I default to making “Brinner” aka Breakfast for Dinner, and my family loves it. On extra busy days, it might be a bowl of cereal. On days where I have time, I’ll make eggs and bacon. But on days when I’m really feeling nice? Those are the days I include pancakes or waffles (or sometimes muffins!) in my brinner recipes. My biggest issue with serving breakfast for dinner is that Jordan always wants pancakes, which I get, but then she wants dessert too. Now, I’m all about dessert after every meal, but when dessert IS the meal? That’s stretching it a little, even for my low standards. Enter: a SAVORY Skillet Pancake Bake. If you make your pancake into a savory recipe, it makes it taste more like dinner. Then dessert is okay, even if you use maple syrup! 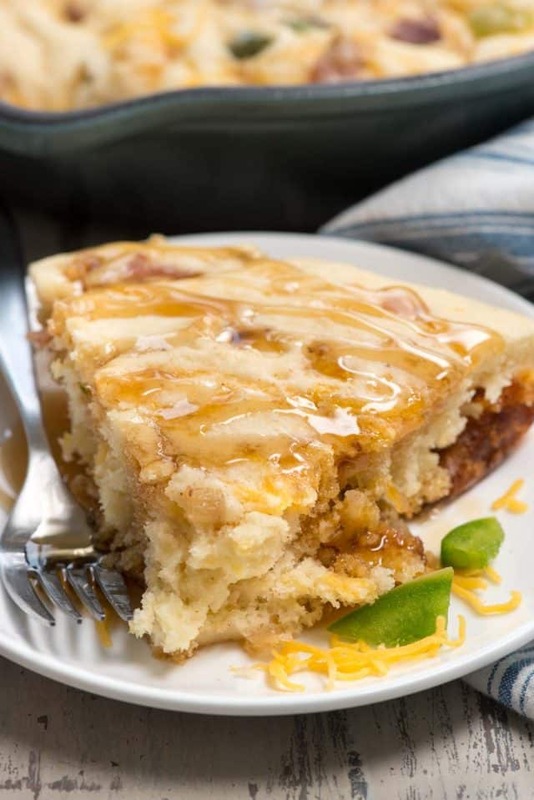 There are so many ways to make pancake bakes, but this version is made in a skillet and is filled with bacon and cheddar instead of berries or chocolate. 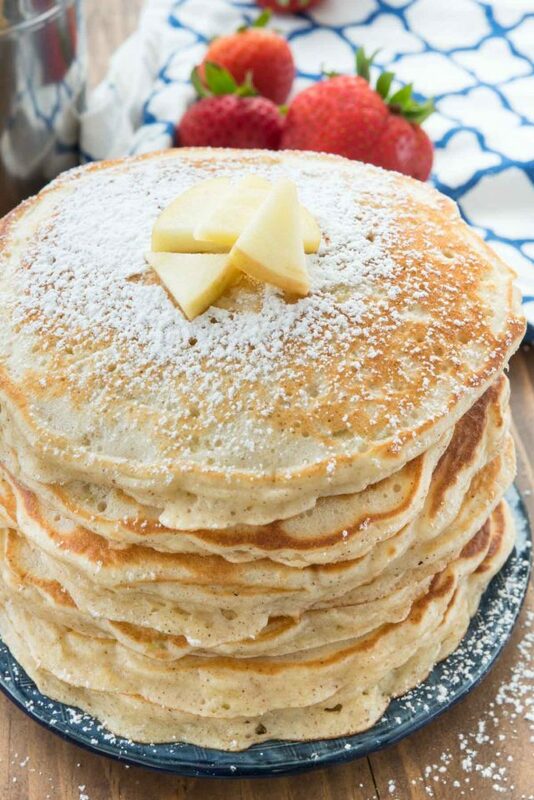 I love making pancakes as bakes because there is no flipping or waiting required: you dump the pancake batter into the skillet and bake. Easy! 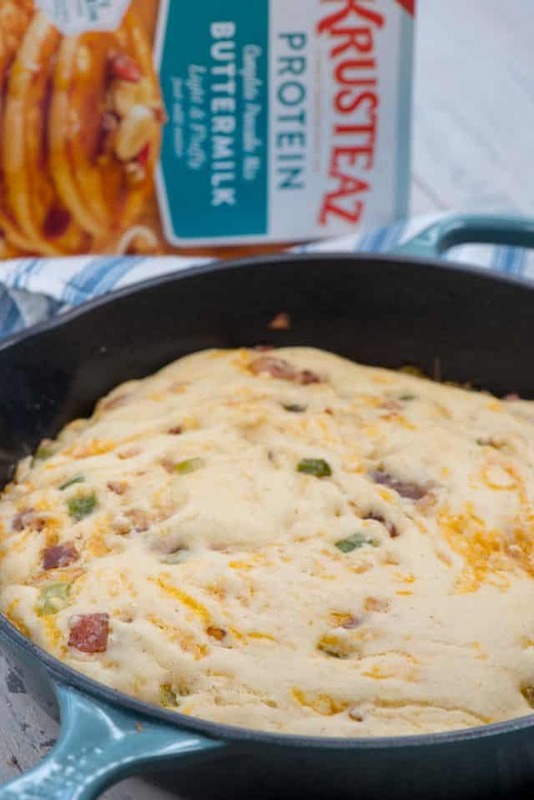 A Skillet Pancake Bake filled with bacon, cheese, and green peppers is the perfect pancake for breakfast or dinner! Everyone and their brother has a favorite pancake mix, and mine is from Krusteaz. I love all their pancake and waffle mixes, but I especially love their new Protein Pancake Mix. It has 13g of protein per serving! That’s a huge win, no matter when you’re serving your pancakes, because it’ll fill up you (and your kids) without being empty calories. No more do I have to worry about Jordan being hungry a few hours after breakfast, not when I make her protein pancakes! This pancake bake turns out almost like a muffin or a cornbread, but it’s a pancake. It’s the perfect side dish to eggs and a fruit salad or even as a soup accompaniment. You can even switch up the fillings (or leave them out completely) to make the perfect skillet pancake bake. Pick your filling. Do you want to leave it plain? Or add bacon? Or maybe sausage, or last nights veggies? The sky is the limit: peppers, onions, meat, mushrooms, pick your favorites! Cook up the fillings, if they need to be browned, in the same skillet you bake the pancake in. If you’re using already cooked add-ins, you can add them to the batter. 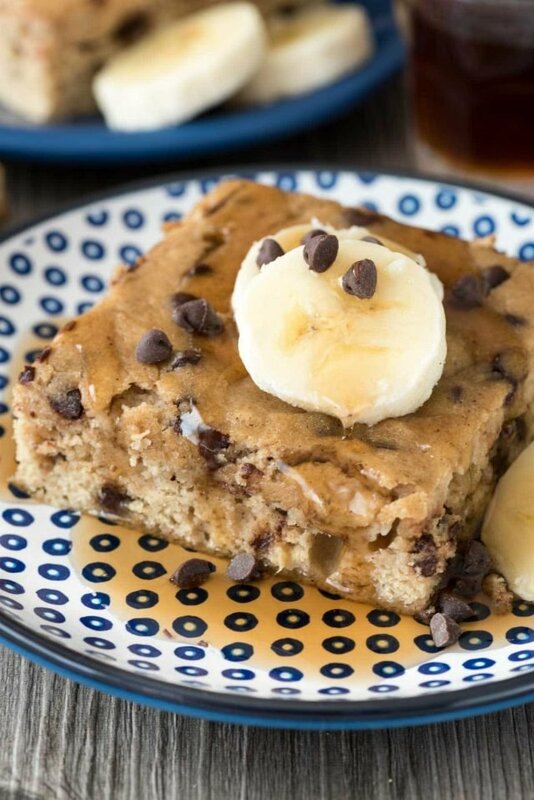 If your skillet doesn’t go in the oven, you can bake this in a 9×9 or 9×13-inch pan. 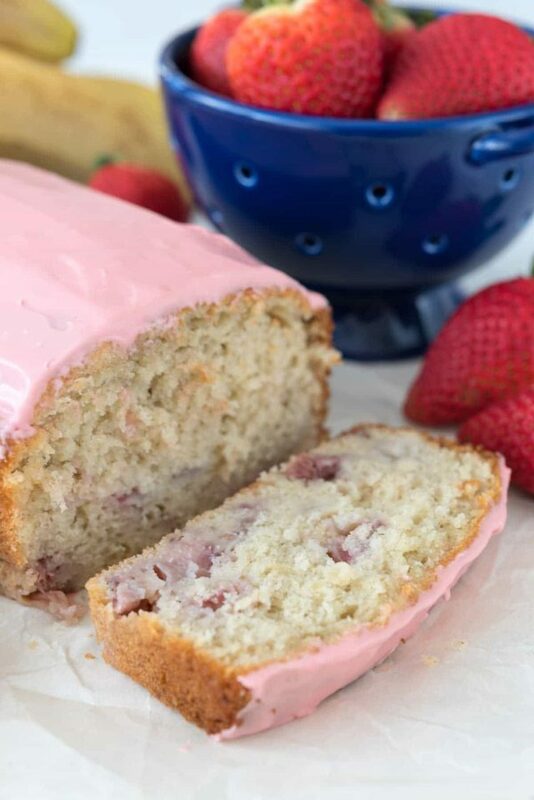 GET THE RECIPE ON THE KRUSTEAZ WEBSITE. This sounds wonderful!! It’s so fluffy and delicious looking! I love the sweet savory here, even if just a small dollop of maple syrup! I usually prefer savory breakfasts, and yes, even for dinner, and sometimes don’t mind a little sweetness, so thank you for this recipe!